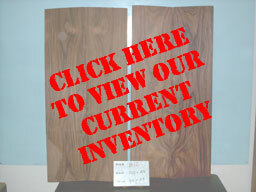 Brazilian Rosewood Guitar Sets - CITES Certified : Hanover Marketing and Trade specializing in helping U.S. and Brazilian companies develop practical import export sales, sourcing plans and more. Universally renowned amongst luthiers and guitar players for its superb tonal quality and unique beauty, Brazilian Rosewood, (scientific name Dalbergia Nigra), has unfortunately suffered from that very renown, and it became an endangered species decades ago. Since 1991 it has been protected under the Convention on International Trade in Endangered Species. 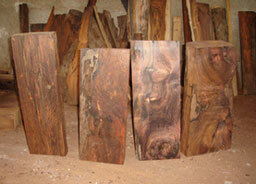 The only legal source of new Brazilian Rosewood consists of the pre-convention stumps of trees cut before 1991, widely scattered over the Brazilian countryside in the Dalbergia Nigra eco-zone. 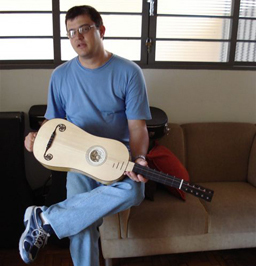 The only licensee in Brazil or any other country who is authorized and certified to harvest those stumps is Hanover Brazil's partner and his staff, luthier Luciano Faria, pictured to the right with one of his own instruments. All of the stumps we harvest are certified as pre-convention Brazilian Rosewood, before cutting, by the Instituto Brasileiro do Meio-Ambiente (IBAMA), or the Brazilian Environmental Protection Agency. IBAMA is the administrative authority in Brazil for the CITES convention. 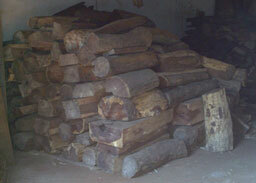 In the U.S., the administrative authority for protected plants is the USDA, which inspects and certifies our shipments upon entry into the U.S.A. We maintain some stock at our office in Hollywood, Florida, and we regularly bring in new wood from Brazil.